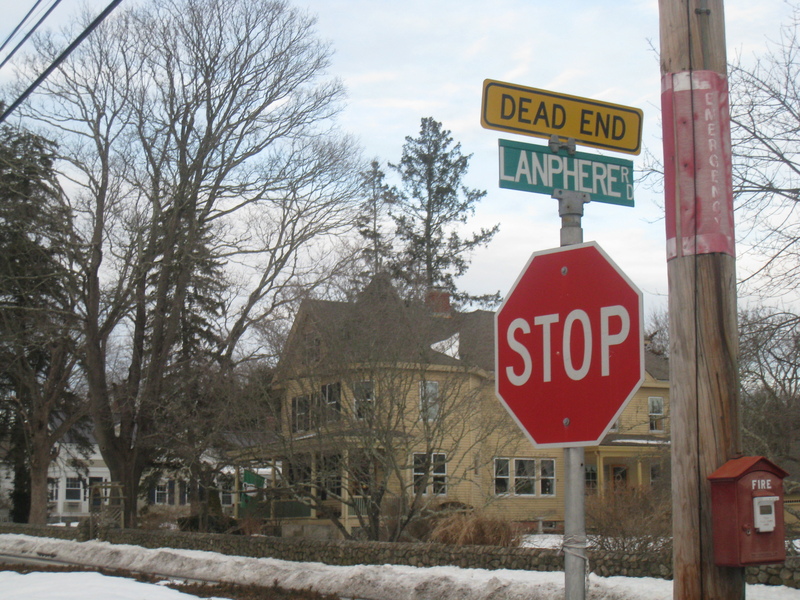 While driving in Westerly one day I discovered a “Lanphere Road” running between Beach Street (Route 1A) and the Pawcatuck River. It’s near the River Bend Cemetery. I was curious about whether that could be the approximate location of my last Westerly ancestor, Russell Lanphere Sr., born 1776, and his parents, Daniel and Nancy Lanphere. Locating Daniel and Nancy in Westerly might be a first step in finding the path of his descent from early Westerly resident George Lanphere. 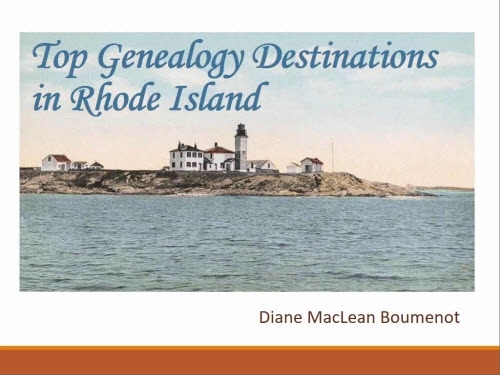 I had previously investigated Daniel’s Westerly, Rhode Island deeds. 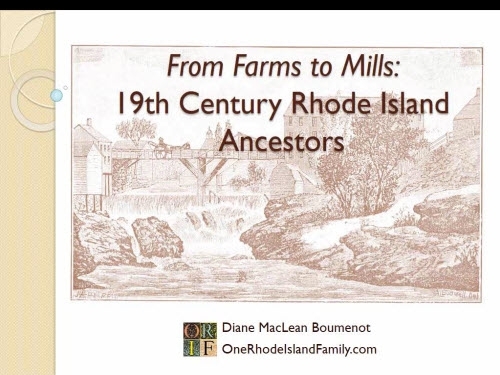 My ggggg-grandfather Daniel Lanphere owned a farm in Westerly. He bought and sold various parts of it over his lifetime. 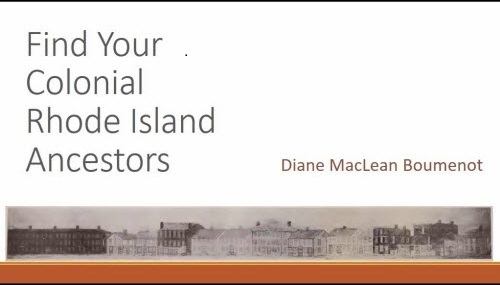 I have seen some suggestions that Daniel owned some of the original George Lanphere property allocated at the time the town was founded in the 1660’s, but haven’t been able to find evidence of that yet. I do have evidence that in 1669 George Lanphere possessed Lot 32 (contact me for the citation) but I have never seen a map plotting those original lots. Looking at a modern map one is struck by some of the streets surrounding Lanphere Road which are named for the early Westerly settlers; names that I saw over and over in the Westerly land records: Clark, Greenman, State. This gives me the idea this area was settled early. “The road that leads to the Pawcatuck Bridge” could be some version of what is today Route 1A, Elm Street/Beach Street or, obviously, an earlier iteration of the road. Today the bridge is in the middle of downtown, separating Westerly from Pawcatuck. It looks like the narrowest spot, and from the scanty evidence I’ve found, I think it was always in the same place. 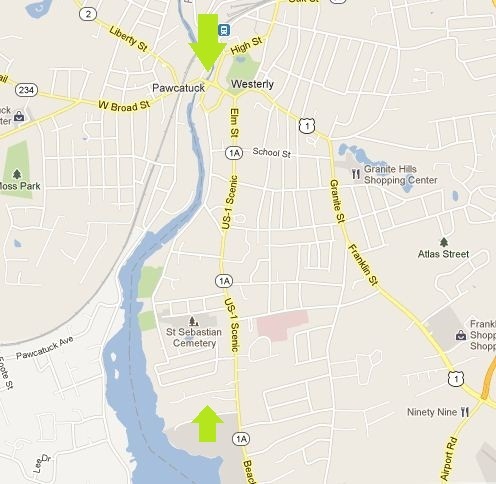 The location of the present bridge over the Pawcatuck River, top, and Lanphere Road, near the bottom. I visited Lanphere Road this week. 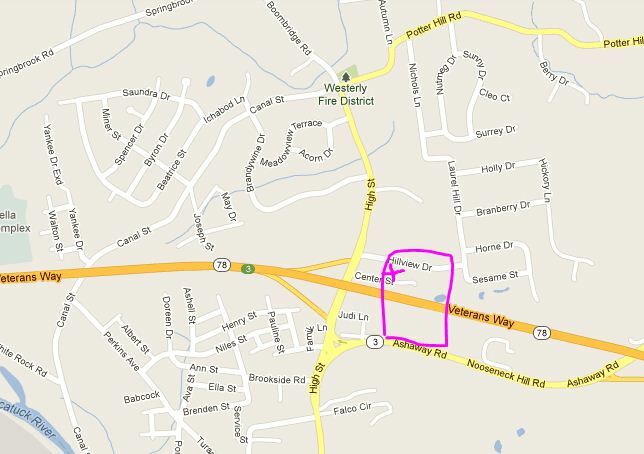 As you can see on the map, the road ends at the river. The area has a few older houses amongst more modern houses, but my husband said when he was a kid, it was mostly woods. There were mid-20th century houses, and perhaps a few earlier, on Lanphere Road. Nothing looked very old … not that I expected to see my ancestors’ modest dwelling that was probably not new in 1810. The only thing that really struck me was that it would seem impossible to describe land in this area without mentioning the Pawcatuck River. And I did not remember any mention of the river itself in those deeds. And one other thing, when I returned home and studied the map: how could Beach Road road EVER make the south border of a property? It runs north/south. I visited the Rhode Island Historical Society to see what older Westerly maps they might have. They had one from 1850 that covered the downtown (“village”) area only. They had a Beers’ atlas containing maps of each town in Rhode Island from 1870; I cannot reproduce that Westerly map here but it can be nicely viewed at HistoricMapWorks.com. I talked to the librarian (which is always advisable when looking for maps at the RIHS; some cataloging of the maps is still ongoing). She asked if I had consulted Westerly and Its Witnesses by Frederick Denison (1878). I explained there were no Westerly maps in the book. She pointed out that my ancestor’s property might have been described. I knew it wasn’t, specifically, but the idea stuck with me to check it over again carefully. I read that book a long time ago. Putting the Pieces Together … of Granite? It was a string of clues in Westerly and Its Witnesses that ended up helping me. Lanphear Ground (2). This is located on the pasture land of the Hon. N. F. Dixon, on the southwest slope of Cormorant Hill, about midway between the residence of Rev. A.B. Burdick and Lanphear Hollow, and within view from the Potter Hill Road. I suspected right away the name “N.F. Dixon” had somehow survived most of the 19th century. A Nathan F. Dixon (in 1810) was the purchaser of all of Daniel Lanphere’s property. His name was mentioned over and over again in the deeds. 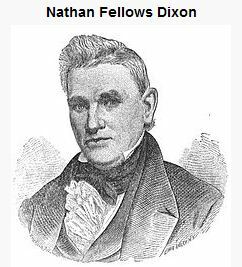 I went looking for him, and I learned that Westerly resident Nathan Fellows Dixon was at one time a U.S. Senator from Rhode Island, and his son and grandson, with the identical name, also had successful political careers. The eldest Nathan Dixon, an attorney, moved to Westerly around 1802, according to the Biographical Directory of the United States Congress. It only makes sense that he would purchase local property as he established himself in Westerly. Senator Nathan F. Dixon, courtesy of Wikipedia. Well, at least our family property wasn’t bought by some nobody. Nathan Dixon appeared several times on the 1870 map, and one of the locations was near “Rev. A. 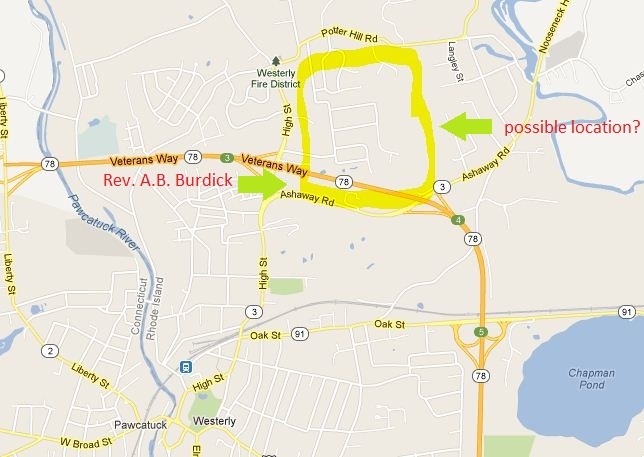 B. Burdick” and Potter Hill Road, although I have never located anything called “Lanphear Hollow” or “Cormorant Hill.” I checked the Rhode Island Historical Cemeteries site and it claims the Clark-Lamphear cemetery is on Route 3, Ashaway Road, “50 feet N of telephone pole #6248”. I will check that out in the future; most historic cemeteries have a marker. The N.F. Dixon property could, at one time, have had a southern border of the “road leading to the Pawcatuck Bridge.” The “Potter Hill Road” location for the cemetery confused me, but perhaps “High Street” had previously been part of Potter Hill Road. The second clue: finding landmarks that ARE on the 1870 map, in this case, granite quarries. OK, now we have a mention of “Cormorant Hill” as the site of a quarry. The third clue: I looked for more information on the quarries and found them in the 1870 map. One quarry was described as “opened by Mr. Jonathan Lamphear and Mr. Ephraim Lamphear on Cormorant Hill, north of Lamphear Hollow.” While it is not on the map (I believe it may have been opened AFTER 1870), based on the quarry locations preceding this one, it could easily be in the location I mapped, above. 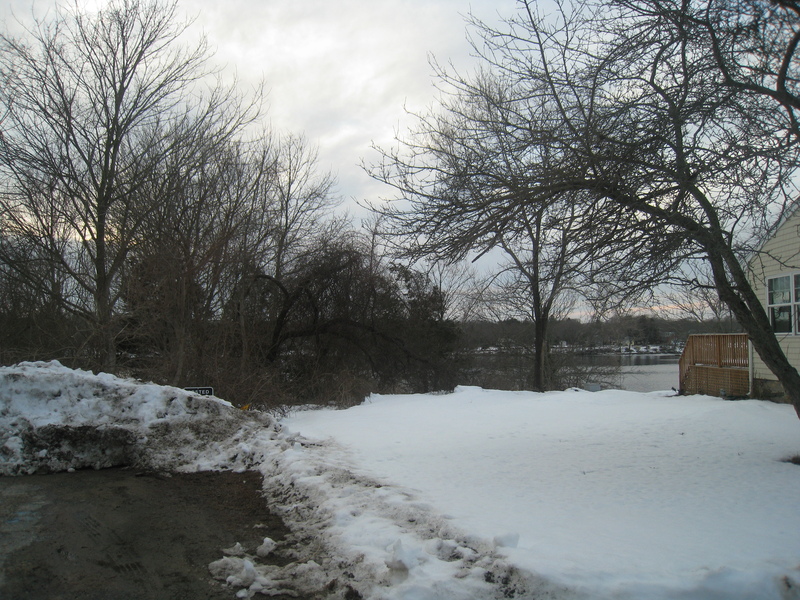 One of the quarries was on “Vincent Hill” – there is a good chance this was named for the neighbor mentioned in the deeds, Dr. Vincent (Dr. Vincent had come from New York, and was likely the first Vincent in Westerly). The location of Vincent Hill (that quarry WAS on the map) is near one of the “N.L. Dixon” spots marked on the map. Knowing Dr. Vincent was to the west of Daniel Lanphere, and the road was to the south, I can now narrow down the property location. My best estimate of Daniel Lanphere’s property, at this point. My husband will be surprised when he sees this map. When I met him, he was living a block away from there. I would like to find evidence of Cormorant Hill, and Lamphear Hollow, to clarify this further. The only clue that is NOT matching is that Potter Hill Road should be near the cemetery; however “High Street” (sometimes called “Upper High Street”) could have been part of Potter Hill Road at an earlier time. I have to say good-bye to Lanphere Road. George Lanphere and two of his sons had original lots in Westerly in 1669: George had #32, Richard Lanphere had #11, and Shadrack Lanphere had #24 (contact me for this citation). Perhaps Lanphere Road originally belonged to one of those sons. Westerly and Its Witnesses mentioned that there were about forty ancient unmarked graves in the Clark-Lanphear Cemetery. It also listed six grave markers that were readable; among them, graves for Capt. Clark Lanphear and wife Wealthy, and second wife Keturah. Hmm, Clark and Keturah Lanphear? Why did I recognize those names? Oh that’s right. I have their son Reuben’s family bible sitting right beside me on the table. But that’s a story for another day. Use this valuable Westerly Deed index on USGenWeb to identify Westerly deeds I would like to see. 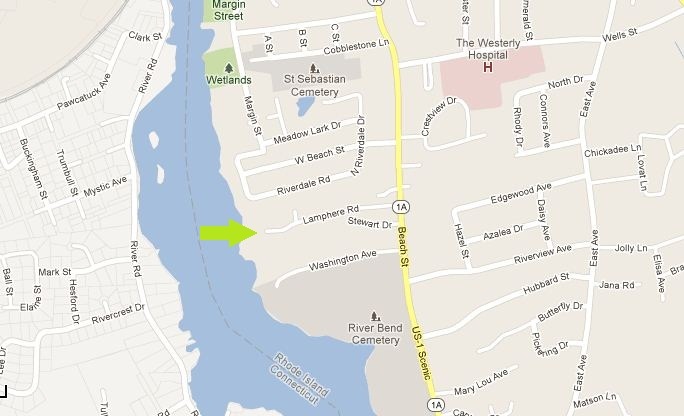 Check out other Westerly maps by consulting a librarian at the Westerly Public Library. Look for more information about the original lots, and settler George Lanphere’s lot #32, and what happened to that. If necessary, use further resources about the Westerly granite industry to pin down the location of the Lanphere quarry. Finish the blog post about the Lanphear family bible. 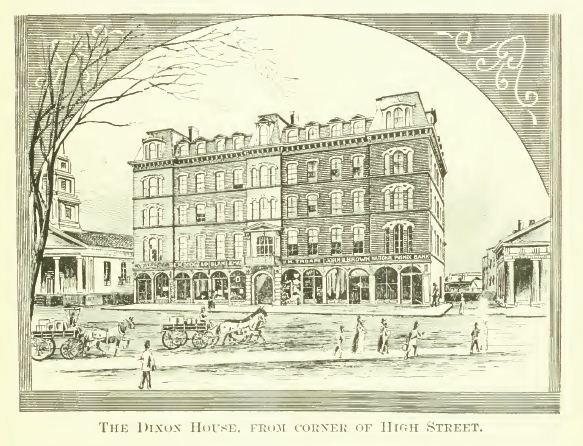 Dixon House, Westerly, from Leading Businessmen of Westerly, Stonington, and Vicinity. Boston: Mercantile Publishing Co., 1889. I recently discovered your blog and find it very interesting. You’re great at presenting facts and details in an entertaining manner! My 8th gr-grandfather was John Lanphere of Westerly, born 1673. He was the father of Anna who married Joseph Lewis, my 6th gr-grandfather. I was very lucky in that I was able to visit Westerly last October while visiting from Idaho. Thanks, Clara. I’m glad you got to visit Westerly in person. I have all sorts of Lamphere problems so I will be blogging about them again. Thank you so much for the extensive Lamphere history. My third great grandmother was Nancy Lamphere Crocker. As always, that was a very interesting and detailed post, Diane. I love reading about the Lanpheres/Lampheres as I too have them in my tree. I especially liked looking at the street names in Westerly. There’s a Hubbard St.—my 9th great grandmother was Bethiah Hubbard of Westerly. Nice to hear from you, Karin. Perhaps someday we will have the Hubbards in common too! I have so much more to uncover about my lines. I will let everyone know when I find Lanphere Hollow. I feel like my questions about that have gotten a lot more solvable. Once again, another interesting post. And to think your research was conducted so close to home, that’s a bonus…no SLC or Boston trips needed. thanks, Barbara. Yup, 350 years later, we’re still here! Never had the sense to go off and make our fortune. Samuel, son of Nathan, moved his family from Westerly to Alfred NY. (and finally settled in Friendship NY. There are many Lanphears in the NIles, NY Cemetery. (the move is documented in the Ethan Lanphear book. I love that Ethan Lanphear book! His first line about “Potter Hill, Rhode Island” always stays in my mind. If my theory about the Lanphere Hollow is correct, it’s not that far from Potter Hill. That wouldn’t surprise me. This was very interesting to me! Thank you for all your work. We are from the Nathan, Samuel, Avery…..line. I’m going on Ancestry.com now and see where this fits in with us. thanks, Jan. Keep me posted. Some of Nathan’s children were apparently close to Daniel Lanphear – for instance, Maxson Lanphere lived next door. Yesterday while visiting the Museum of History and Industry I notice one of the exhibits included oral history from Phyllis Lamphere, a former City Council woman and civil rights activist here in Seattle. I definitely stopped and listened to her story and wondered if somewhere back in time we had a family connection. I wouldn’t be at all surprised, Val. SO many of the siblings of my ancestors took off for greener pastures. There just wasn’t enough land here for everyone. And although I’m no expert on migration patterns I sometimes see a northerly track through, say, New York, Ohio, Michigan, then the northwest. My mom lives in central New York and I always tell her, if you meet Lampheres, you’re probably related to them!